Known for his fluorescent figuration, Haring was a graffiti street artist committed to public accessibility of his work. The Pop Shop series emerged as the shops Haring opened in New York and tokyo. Pop, in this case, refers to the allegorical figurations, colors, and idols that appealed to the masses. 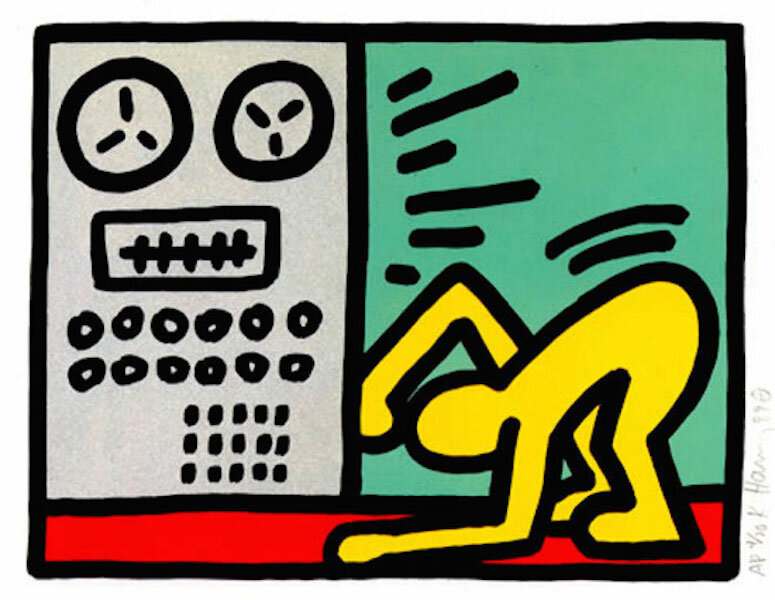 Pop Shop III by Keith Haring is a suite of four silkscreen prints on paper created by Keith Haring in 1989. These four prints by Keith Haring are each available in editions of 200. Keith Haring is recognized for his exclusive use of black and white, and typical use of primary colors, the figures were simplified, and easily recognizable as his. They formed glyphs that could be read, like an urban, tribal language.